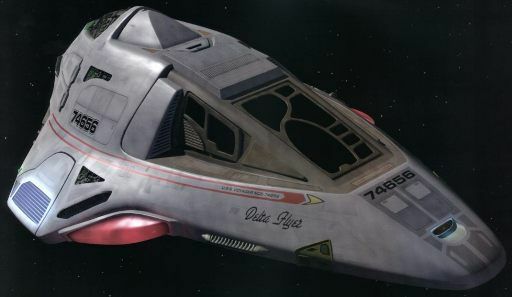 Notes: Designed and built by the USS Voyager's crew, the Delta Flyer is intended to be a multi-purpose vessel along the lines of a heavy duty shuttle or Runabout. The craft incorporates many systems unique to a Starfleet design - a result of the Borg technology Voyager has experienced on its journey home. The hull of the Delta Flyer is highly aerodynamic, and is composed of tetraburnium alloys with parametallic plating. The warp nacelles are variable geometry1, reflecting Voyager's own warp drive system. The layout is fairly conventional - a large cabin occupies the front portion, with the engineering section aft feeding nacelles to port and starboard. The EPS conduits in the plasma manifold are isomagnetic, minimizing power losses and increasing engine efficiency. There is a small cargo bay and transporter system installed in the flyer, along with the various systems usually associated with a vessel of this type. The area where the Delta Flyer differs most from Starfleet designs is in the defence systems. The unimatrix shielding was developed by Lieutenant Commander Tuvok, while the weapons array developed by Seven of Nine is based on Borg technology and includes photonic missiles. While most of the Delta Flyers control systems are conventional, the helm controls are based on those of early to mid 20th century aircraft - a choice made by Lieutenant Paris for aesthetic reasons. Paris also wanted to add dynametric tail fins to the nacelles, claiming that an intimidating look would deter attackers, but he was overruled. A vessel like the Delta Flyer is a good example of Starfleet's recent policy of allowing Starships the freedom to develop their own shuttle designs - although in this case Starfleet naturally had no say in the matter. The Intrepids were one of the first ships designed to produce field-replicated and field-designed shuttles, and Voyagers success in producing a vessel of this size and capability is further proof that Starfleet's policy is the correct one. On the Flyer's first mission it successfully rescued an advanced probe from deep within a gas giants atmosphere, and was subsequently a valuable asset for Voyager.